You have to love that there was a comic called, “Journey Into Mystery” … and that it made it to 107 issues by this point. You have to love Stan and Jack created a villain named “The Grey Gargoyle” … and that they repeated his origin in each of his first four appearances almost verbatim. And, that said villain could be seen as worth of going toe to toe with a god. Dr. Doom Ettiquette Note: One must take time to get one's villainous boots on properly, lest one be horribly embarassed. And, that, when attacking Dr. Donald Blake, his weapon of choice is … a paper airplane he turns into stone. I FREAKIN’ LOVE THAT!!!!!! Only in Marvel, kids. They’re here all week. Try the veal. Modern comics are nice, but I have always … always … had an affinity for the classics. And, J.I.M. has been a particular favorite. I even tried to mount a relaunch of the title in 1985, but Marvel somehow did not take a shine to the hand-drawn, un-inked covers I mailed … with no stories inside. Go figure. Evidence Below. Please, don’t ask me what “Klink the Iron Knight” was going to be all about. Or, what “J.O.E.” stands for in “Godakin J.O.E.” Or, even what “Godakin” means. I’m not sure I ever really had a plan. 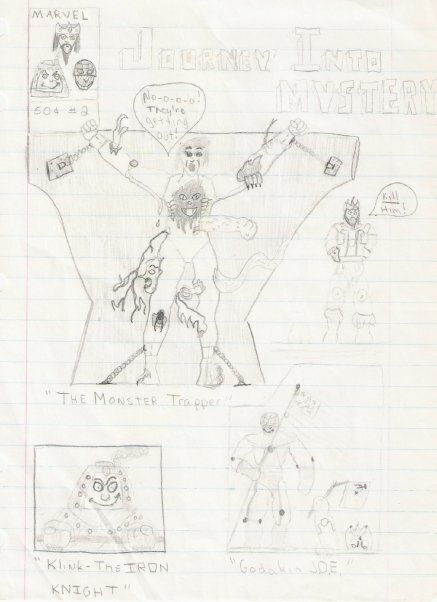 This entry was posted in Comic Book Humor, Comic Books and tagged Comic Books, Comics, Grey Gargoyle, Jack Kirby, Journey Into Mystery, Marvel, Stan Lee, Thor. Bookmark the permalink. Dude please tell me you’re shopping that around at the cons! I want to see you and Bendis on Dark Clink!